Steve Goldstein ’78, a professor at the University of Chicago Pritzker School of Medicine, has been appointed provost and chief academic officer, university president Fred Lawrence announced Wednesday. The board of trustees unanimously accepted Lawrence’s naming of Goldstein, a pediatric physician and former faculty member at Yale, to succeed eight-year provost Marty Krauss as Brandeis’ second-in-command. “His background in education and his Brandeis experience as an undergraduate, understanding the mission of the liberal arts university,” Lawrence said in an interview with The Hoot, was integral to his selection. “He has the skills of an administrator, the skills of a scholar and the skills of a teacher—with the soul of the Brandeis experience,” he said. Brandeis, proud of terming itself “the liberal arts university,” will now have a medical doctor and scientific researcher atop its academic administration. Lawrence made clear that with all Goldstein’s success in science and medicine the president found “a passion for the arts and humanities” as well. “They all start with the same basic core skills: motivation and rationality,” he said. “The importance to society of the arts and humanities is equal or even greater to that of the sciences,” Goldstein said, even to him, a celebrated medical doctor and scientific researcher. Goldstein will be the first provost since a university restructuring committee strengthened the office’s powers relative to other senior staff. The provost is “first among equals” after the president, according to university administration, and the dean of arts and sciences, graduate schools heads and registrar are among those who will report to Goldstein. He said that his experience managing medical education and running hospital centers would lend itself well to the university environment as well. “The levels of complexity are similar, if not identical—the people there have their equivalents at a university,” Goldstein, who will be in charge of staff representing one of the most diverse portfolios on campus, said. One of Goldstein’s biggest goals when he takes over formally on Sept. 1 will be getting to know the student population. The new provost mentioned office hours and other student interaction as part of his “weekly schedule” and even suggested a weekly “Lunch with the Provost” table event, if possible. Interested students would be able to sign up and ask Goldstein about his work and anything Brandeis, especially providing an outlet for students on academics. 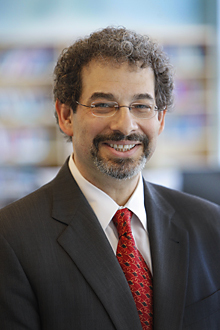 In addition to the faculties of Chicago and Yale, Goldstein holds other professional credentials as a doctor, including as physician-in-chief at Comer Children’s Hospital and as editor of the Quarterly Review of Biophysics. He and his wife, Emily Novick, a former Brandeis residence life staff member when she met her husband, have three children, two of whom are college students.